Flute: A groove or channel, esp. 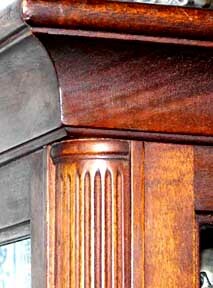 one of many such parallel grooves usually semicircular or semielliptical in section; used decoratively, as along the shaft of a column. 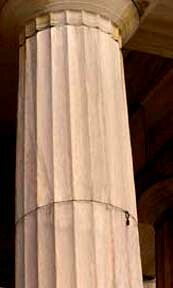 Commonly found on Greek columns (vs. Roman columns where the shaft is usually smooth). 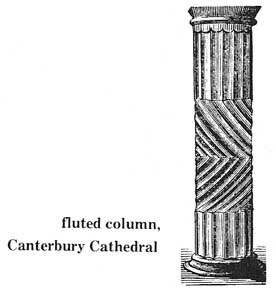 For Greeks, fluting may have been a highly stylized memory of wood grain, for the earlier Greek columns were wood (For the derivation of Greek architecture features, see Greek Architecture and American Buildings). Stopped flute: In classical architecture and derivatives, a flute terminated, usually about two-thirds of the way down a column or pilaster. Below this the shaft may be smooth or faceted, or the fluting may be incised part way. 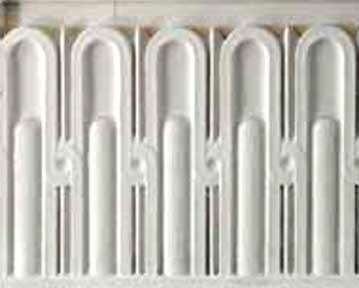 Cabled fluting: A molding of convex section formed in the flutes of a column, usually in the lower third of the shaft. "The Corinthian column is almost always fluted... Even the flutes of a Corinthian column may be enriched. They may be filleted [ridged], with rods nestled within the hollow flutes, or stop-fluted, with the rods rising a third of the way, to where the entasis begins. Term applied to shallow, hollowed out grooves which are always vertical. They can either run from the top to the bottom of a post, or side by side.